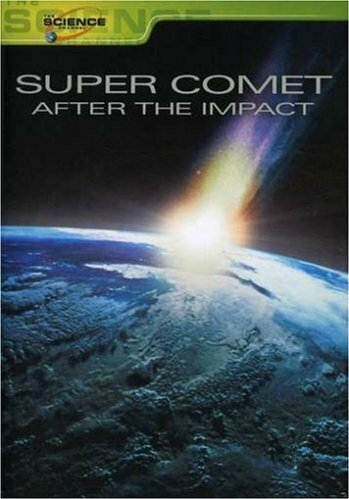 Super Comet: After the Impact is a Speculative Documentary produced by the ZDF and the Discovery Channel about what would happen if a comet hit the earth in the same place the asteroid that wiped out the non-avian dinosaurs did. The German version is called Armageddon - Die längste Nacht (German for "Armageddon - The Longest Night"). It is available (on an on-and-off basis) on the ZDF Mediathek and can be downloaded with "MediathekView ". Anyone Can Die: Countless people die, among them Fernando. Apocalypse How: At least a Class 3. Colony Drop: The comet's impact. Darkest Africa: A tribe in Cameroon is shown as a group of focal survivors. Giant Wall of Watery Doom: New York City (and it's safe to say plenty of other Atlantic cities) falls victim to one. Hope Spot: Fernando is out of food, and has been abandoned by his dogs, but he has hope as he scales a large hill. Once he reaches the top, he breaks down in despair once he realizes he has only found the smoldering, colossal impact crater, and the narrator describes it as the "end of the road for Fernando". History Repeats: The premise of the film is that a comet of the same scale of the one that killed the dinosaurs impacts Earth in the same location in modern times. Mass "Oh, Crap! ": The entire world, naturally, when the mission to stop the comet fails. Pet the Dog: Three dogs are brought into a bunker by Fernando, and are allowed to live (as far as we know) throughout the entire documentary.